Kai’Sa’s low-cut Void-suit, shorter ADC attack ranges, and assassins. Let’s talk about shorter ADC attack ranges, assassins with AoE abilities, and Kai’Sa’s Void-suit. The newest ADCs are short ranged (Kai’Sa and Xayah) and you recently nerfed Kalista’s and Tristana’s attack ranges too. Why are you making marksmen have shorter ranges? Attack Range is perhaps the most powerful stat in League of Legends. For some champions, simply citing their range can be the easiest way to convey to another player why they are powerful (“Caitlyn is 650 range, she’ll always be relevant”). The corollary of that, given that every champion needs to be balanced around comparable power budgets, is that the more attack range a champion has, the less power we can give them in the rest of their kits. The set of marksman champions contains some of the most similar properties to each other, and we’ve been striving to differentiate the experience of playing one from another. For Kai’Sa and Xayah, both champions had class-stretching strengths we never thought we could put on an ADC (assassination, untargetability), so it was important that we didn’t genericize them by giving the exact same range as their counterparts. Our champions need to be interactive and possess meaningful weaknesses, so being outranged by most other marksmen felt like a reasonable approach. On the other hand, Kalista and Tristana are two champions that have frequently lacked meaningful weaknesses. Our approach in the past has been to tweak values like base damages or attack speed scaling, which has appeared to work in the short term, but often just deferred the problem to reappear in a few months. Instead of watering down the strengths of these champions, we opted to preserve what is unique about them and instead create new weaknesses with Attack Range reductions. This isn’t a change we do lightly, but we do feel the benefits of the work we’ve done here outweigh the costs. We will create new long-range marksmen in the future as we find compelling kits or fantasies that would be good fits for the artillery-style gunslingers, and we’re unlikely to reduce the attack range of any other marksmen any time soon. Why do so many assassins have aoe abilities? Aren’t they supposed to assassinate a single target? For any class of character, we have defined goals for what they should be capable of. In this case, you’re right on: We intend for assassins to do “bursty single target damage.” But this doesn’t mean we have to constrain every action or spell to that box, as long as we don’t break our original goal (single target burst). For example, Ekko and Talon have AoE abilities on their kits. We think this is okay because compared to other champions like Twitch, Cassiopeia, and Karthus, they don’t do sustained AoE damage in the same way. More specifically, we expect that the assassins would do 50% less total AoE damage in a ten second teamfight. As a general note, we have trended towards more AoE abilities in the recent years of champion design because they allow for much more exciting options in spell shape, timing, decisions, and context. Ekko’s Q, for example, results in many different and interesting outcomes in number of hits, using dashes to dramatically change the return missile, and playing off of the minion wave to trigger the second stage early. It’s worth calling out that in a few cases, such as with Katarina, we actually break our own rule. This is intentionally done, and it’s a unique strength that the champ should have to give up other things to have. In this case, Katarina sacrifices single target assassination potential and on-demand aggressive mobility compared to Zed, who has much less AoE output. A few months ago, you said you’d no longer add unnecessarily hyper-sexualized champions, only if it made sense for the character like Ahri or Evelynn, and therefore someone like Miss fortune or Caitlyn could use a redesign. 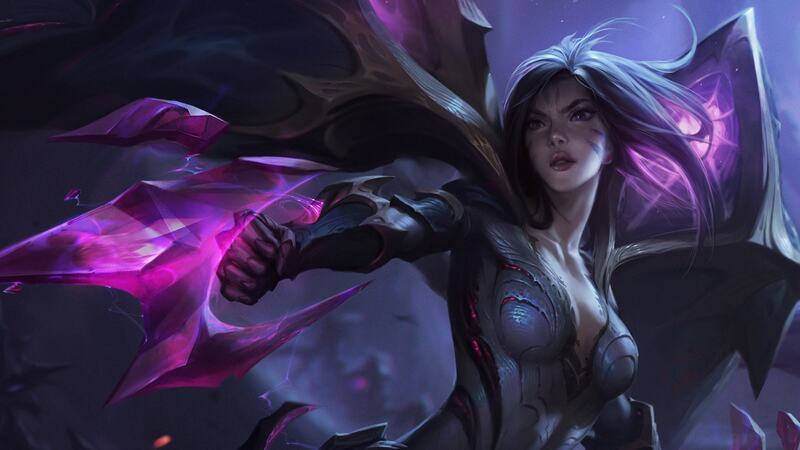 What happened to this thinking when they designed to Kai’Sa and her unnecessarily deep neckline? We’ll be the first to admit that Kai’Sa’s neckline didn’t land well with players and that it made her look unnecessarily sexualized, even if it that wasn’t the intention. From the beginning of her development, we wanted Kai’Sa to be a regular human who survived the Void by coexisting with a Void creature—not someone who escaped but was corrupted by the experience. We felt that this was what made her unique in the Void champion line-up, and plus, we’d recently made a corruption-themed champion with Kayn. For these reasons, it was really important for us to make sure Kai’Sa looked like a human wearing a Void-suit, rather than a monstrosity created by the Void. Early on, Kai’Sa didn’t have a deep neckline. When we got her in game, we realized her dark hair combined with the suit made her look more “Void creature or corrupted human” than “normal person wearing a Void-suit,” particularly because the human skin showing on her face was small onscreen and difficult to read from the in-game camera. Our artists tried a few things to try and address this, and the one that worked well was redesigning her neckline so you could see her human skin more clearly when her mask was off. With this change, more playtesters interpreted Kai’Sa as being a human wearing a suit rather than a human who was corrupted. In retrospect, we recognize we should’ve prioritized searching for other ways to solve this problem, especially because the end result didn’t land well for many players. Even though we had good intentions, we could’ve done better, and in the future, we will be even more conscious of these decisions.